Mayrhofer, M. (2018). Opportunities and Pitfalls of Anti-discrimination Policies in the European External Action Service. Peace Human Rights Governance. 2(1), 51-74. Landman, T. (2018). Out of the Shadows: Trans-disciplinary Research on Modern Slavery. Peace Human Rights Governance. 2(2), 143-162. [Anonymous] (2017). 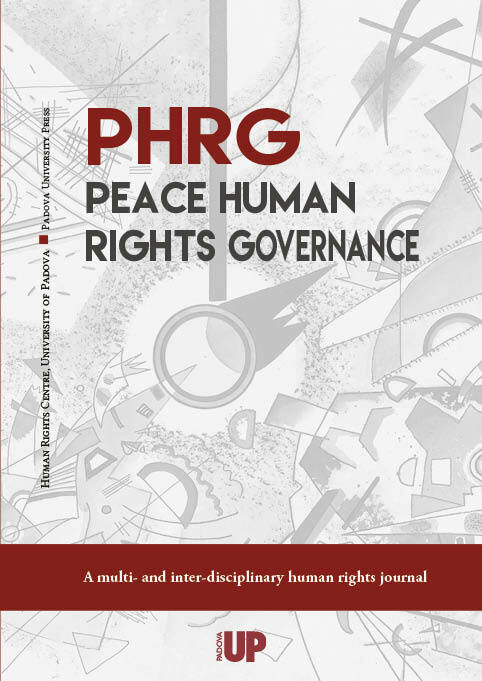 Peace Human Rights Governance: A New Academic Journal of the University of Padova. Peace Human Rights Governance. 1(1), 9-12. Freire, J. (2018). The Promotion of Local Policies in Human Rights and How the Results are Affected by the Local Perspective – A Case Study. Peace Human Rights Governance. 2(2), 257-270. Ghanem, C. Yasmin (2017). Providing a Gender Perspective to Integration in Western Europe. Muslim Women’s Agency between Multicultural and Assimilationist Policies. Peace Human Rights Governance. 1(3), 307-332. Nyangweso, M. (2017). Religion, Human Rights, and the African Widow. Peace Human Rights Governance. 1(3), 365-391. Claus, L. Kondo, & Morilas L. Romano (2018). The Right to the Pursuit of Happiness and the Right to Access Medical Treatment: Recent Developments in Brazilian Jurisprudence. Peace Human Rights Governance. 2(1), 119-133. Candelmo, C., & Nardone V. (2017). Satellite Evidence in Human Rights Cases: Merits and Shortcomings. Peace Human Rights Governance. 1(1), 87-113. Krivenko, E. Yahyaoui (2018). Towards an Integrated Approach to Democracy in International Law. Peace Human Rights Governance. 2(3), 279-300. De Stefani, P. (2017). Using social media in natural disaster management: a human-rights based approach. Peace Human Rights Governance. 1(2), 195-221. Fanciullo, D., & Iermano A. (2017). Women with Disabilities: Towards a More Effective Protection. Peace Human Rights Governance. 1(1), 15-41.